“The year-over-year advance of 3.9 percent seems to realistically capture the rate of improvement in nonresidential construction spending.”—ABC Chief Economist Anirban Basu. 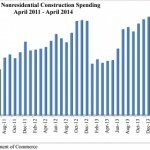 Nonresidential construction spending inched up in April according to the June 2 release by the U.S. Census Bureau. This is the second consecutive month spending has increased following March’s upwardly revised spending report. Nonresidential construction spending expanded by 0.4 percent on a monthly basis in April and has risen 3.9 percent on a year-over-year basis. Spending for the month totaled $570.6 billion on a seasonally adjusted, annualized basis. 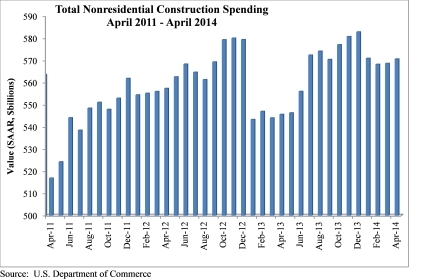 Ten of 16 nonresidential construction subsectors posted increases in spending in April. Lodging construction spending is up 1.9 percent on a monthly basis and is up 16.9 percent on a year-over-year basis. Office-related construction spending grew by 1.7 percent in April and is up 20 percent from the same time one year ago. Construction spending in the transportation category expanded 3.4 percent on a monthly basis and has expanded 8 percent on an annual basis. Religious spending grew 1.8 percent for the month but is down 5.9 percent from the same time last year. Commercial construction spending rose 1.2 percent in April and is up 5.9 percent on a year-over-year basis. Sewage and waste disposal-related construction spending gained 4 percent for the month but has fallen 5.5 percent from the same time last year. Amusement and recreation-related construction spending expanded 4.4 percent on a monthly basis and is up 3.2 percent from the same time last year. Health care-related construction spending grew 0.9 percent for the month, but is down 6.2 percent on a year-over-year basis. Conservation and development-related construction spending expanded by 3.6 percent for the month and is up 19.7 percent on an annual basis. Spending in six nonresidential construction subsectors declined in April. Spending in the water supply category fell 0.2 percent on the month and is down 12.8 percent from the same time last year. Manufacturing-related spending fell 1.1 percent on a monthly basis, but is up 6.7 percent on an annual basis. Highway and street-related construction spending fell 1.1 percent in April, but is up 4.8 percent compared to the same time last year. Communication construction spending was down 11.7 percent for the month but is up 21 percent from the same time one year ago. Public safety-related construction spending fell 0.9 percent on a monthly basis and has declined 12.4 percent on a year-over-year basis. Power construction spending dipped 1.2 percent for the month and was 1.6 percent lower than the same time one year prior.